Chicken cutlets are great as is but if you want to turn them into a real feast try making Chicken Parmesan. Once you have mastered making chicken cutlets, there are just a few extra steps and ingredients needed to make chicken Parmesan. First, preheat your oven to 350 degrees. Then make the chicken cutlets according to my video. When the chicken is all cooked take it out of the frying pan. Set the cooked cutlets in a baking dish big enough to lay them flat in a single layer. Using a spoon put about 1 cup of your favorite spaghetti sauce around the cutlets. You can make your own spaghetti sauce from scratch or use a jar of spaghetti sauce. I don’t like to drown the cutlets in sauce. You can always add more later if you want. Top with 8 ounces of shredded mozzarella cheese. Or fresh Mozzarella and shred it yourself. Sprinkle 1/4 cup of parmesan on the top. The Chicken Parmesan is now ready to pop it into a 350 degree preheated oven for about 25 minutes. When the cheese is all melted and bubbly it’s ready to serve with some spaghetti. 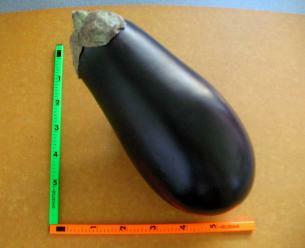 Vegetarians might like to try Eggplant Parmesan instead! Good luck – I am so delighted to see your dream come to fruition. Good Luck tomorrow! I hope all goes well. You deserve the very best! Hi little deer and welcome! If you are feeling really adventurous, be sure to check out my recipes for Pasta Marinara Sauce or Pasta Sauce with Turkey Sausage. This is undoubtebly the best site on the internet I’ve found. I am a student who just started living alone, and suddenly found interest in cooking good food ( because of the lack of it where i am now) and this blog has a great variety of tasty and fairly easy to make recipes. The Videos are even greater, cant wait to get more! Should this be in the middle rack? I’m really confused as to when I should put stuff in the middle or lower rack of oven! Help! Are you using a fan-oven? If so then there shouldn’t be such temperature fluctuations and if there are you should get the oven checked. If it’s not, can I suggets that you get an oven (not meat) thermometer which hangs on the front of the rack and you can then use to check the temp of you oven as you cook. Wow, that looks really tasty! I’m in a similar situation to Ghassan. I graduated from college last year, and while I knew a few recipes then, I’ve been trying desperately to expand my recipe selection and cooking skills mostly out of necessity. Who wants to eat the same thing all the time or pay to eat out everday? I;ve been looking around this site and I’ve been really impressed. I can’t wait until this weekend so I can try some of your stuff! That’s great to hear Adam! Good luck and be sure to let me know how everything turns out! I owe so many great dinners to you! Once I found your website, I unleashed a cooking soul inside of me that I never thought I had! Your chicken parm is what started it all! My boyfriend and I love this recipe! Thanks for all that you do Kathy! I subscribed and look forward to more of your delicious recipes! Thanks Anjulee! I love comments like this! I have a question…. if the chicken is already cooked, and you’re essentially just adding sauce and cheese, why does it take 25 minutes to “cook”? Hi TR, The sauce is cold and the cheese needs to melt and turn golden brown. 25 minutes is what it takes to warm the whole dish and melt the cheese so that it is nicely browned and looks delicious! Mmmm.. this looks yummy.. I just got home and I’m really starving. I think I might start prepare something like this. Thank you! I’m so happy I found your site. Finally, great recipes without having to use hundreds of special spices or ingredients! Thank you. startcooking.com is all about the basics – nothing is too fussy or complicated. I am astounded by what some cooking sites consider “easy”! I just made the cutlets/ckn parmesan. It was so wonderful!! I did add parsley, parmesan and a little salt and pepper to the bread crumbs. Thanks so much for your great recipe. I always keep a box of plain as well as seasoned bread crumbs in my food cupboard. Adding your own parsley and Parmesan to bread curmbs is a great idea. Dried oregano or basil would be a great addition as well. I made this last night and it came out GREAT! There are tons more recipes to choose from as well! I am cooking chicken parmesean for the first time Wednesday night. I’m so glad I found this website. A lot of the other recipes that I found that were “easy” were not easy at all. haha. They called for too many ingredients. I saw on one comment that you said we could add dried oregano or basil. That would bring more flavor right? and about how much would you say you would add? and where could I add that? Thank you for sticking to the basics Have a blessed day! Welcome! You can be assured that EVERYTHING on my site is designed for the beginner cook to be able to make. For a bit of extra seasoning, you can mix in 1 teaspoon of dried oregano and or basil to the bread crumbs. Good luck on Wednesday night! I really enjoy how you present recipes. They are easy to prepare with lots of great pictures. This dish can be prepared easily at the end of a busy day! It is a keeper!! Yum! This dish looks so good! I’m going to definetly try this one out. I’ve learned so much and I’m just inspired. Hi Marie, welcome and thanks! 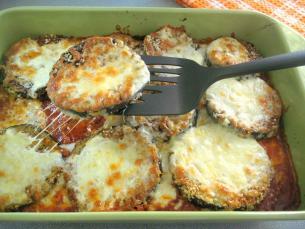 This recipe is as good as it looks, but I actually prefer the eggplant Parmesan. I’m vegetarian and used Gardein Chicken Scallopini (fake chicken breast) which is far better than eggplant – tastes like chicken – same texture but without the fat and without the cruelty. Great recipe! I tried this the other night and by the time we were done with dinner there were no leftovers. So to say the least this recipe was a hit. Kathy, your blog and how-to videos are fantastic!! I have never made chicken Parmesan before but after watching your how-to video on chicken cutlets, I decided to try it using your recipe. My entire family loved it! Your technique of flour, then eggs, then breadcrumbs made the chicken so crispy on the outside and tasty. Everyone loved it – thanks so much!! This one is a definite keeper. I am delighted to hear how everyone seems to be really enjoying this recipe!